Portugal – every day's a holiday! 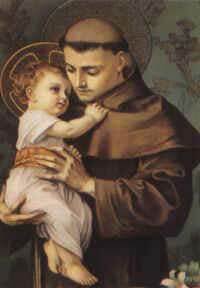 Cities and countries around the world celebrate St. Anthony’s Day, from Lisbon, Portugal to Wilmington, Delaware, not to mention cities in Brazil, Mexico, Italy, and even India! The Brazilians get the jump on the celebrations by commemorating June 12, the day before his feast, as Día dos Namorados, or Day of the Lovers, a Brazilian Valentine’s Day, in honor of the matchmaker saint. In the morning, special services are held in the church built over the spot where he was born, and vintage convertible cars carry throngs of “St. Anthony’s brides” down the Avenue Liberdade. 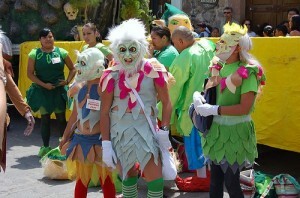 The award for the most unusual St. Anthony’s Festival goes to San Miguel de Allenda, Mexico. There laborers originally celebrated May 17 as San Pascual Bailon (St. Pascal Baylon) Day, in honor of the patron saint of field and kitchen workers. The popularity of the San Pascual Bailon parade overshadowed that of the more established San Antonio (St. Anthony), and the two festivities merged. Now the festival is held the Sunday after June 13 and is known as El Día de los Locos, or Day of the Crazies. Italian Festivals in the U.S.
Portugal Day marks the death of writer, historian and adventurer Luís de Camões in 1580. 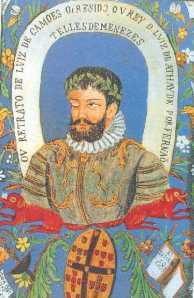 Camões wrote the Portuguese national epic Os Lusíadas , a history in verse of the Iberian nation and the era of discovery. Compared to his writings, little is known of Camões’ real life. He was banished from Lisbon in 1546, supposedly because of an affair with a lady of the court. He served in the military for two years in Morocco, where he lost his right eye. He returned to Lisbon where the king (John III) pardoned him for injuring an officer in a street brawl; then spent 17 years in exile from his homeland, living in Goa, India and Macau, China. During these years he conceived of and wrote much of Os Lusíadas. Legend tells us he survived a shipwreck in the Mekong Delta in Vietnam, keeping his manuscript dry by swimming with one arm and holding it above the water with the other. Camões presented his masterpiece to King Sebastian in 1572 and won a small royal pension. However, he spent the end of his life in in a Lisbon poorhouse. The year of Camões’ death, King Philip of Spain claimed the throne of Portugal after the disappearance of King Sebastian at the Battle of Alcácer Quibir. Portugal remained under Spanish control for sixty years. Today, citizens of Portugal get the day off, the President addresses the nation, and Portuguese around the world gather to celebrate their homeland and their heritage. But the most famous sighting in modern times may be the one that took place on this day (May 13) in 1917 in Fátima, Portugal. As the World War raged throughout Europe, three Portuguese children—Francisco and Jacinta Marto, ages 9 and 7, and their cousin Lucia Dos Santos, age 10—were building a wall in the fields when their play was interrupted by a flash of lightning. 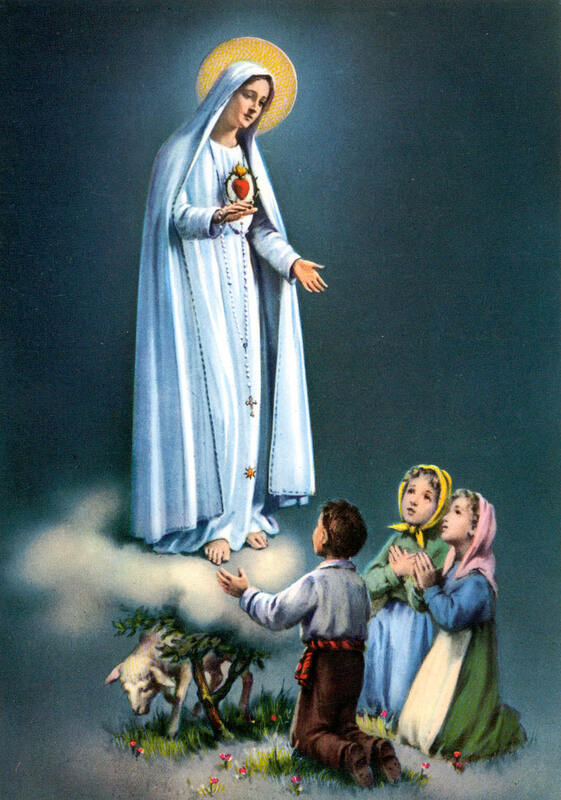 The apparition answered the children’s questions on heaven, and entreated them to return on the 13th of each month thereafter. At subsequent encounters she told them about heaven, hell, and God’s message. Over the next 5 months, word spread of the children’s encounters. By October 13, 70,000 people gathered in the field hoping to catch a glimpse of “Our Lady of Fátima” (now also known as “Our Lady of the Rosary”). “After the long extensive rains, the sky became blue, people could easily look into the sun, which started to spin round like a wheel of fire which radiated wonderful shafts of light in all sorts of colours. The people, the hills, the trees and everything in Fatima seemed to radiate these marvellous colours. Sadly, Francisco died only 2 years later and Jacinta the year after that. 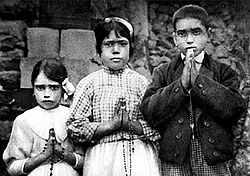 Pope John Paul II beatified Francisco and Jacinta on May 13, 2000. Lucia lived to the ripe old age of 97. She died in 2005. May 13 is celebrated in Portugal and by many Portuguese Catholics in other parts of the world. On May 13, 2009, “The 13th Day”, about the miracle of Fátima, premiered at the Cannes Film Festival in France.